We were excited to be awarded this multi level Garden Decking and Hot Tub Gazebo project for our client in North Yorkshire. Creating features into a mature and established garden presents greater challenges as many of the plants, bushes and features are very well established and years old, almost irreplaceable. It was hugely important that our works were detailed and contained. The primary focal point was a newly purchased hot tub which was to be made part of a newly designed and built entertainment area. We designed and built a split level decking area. 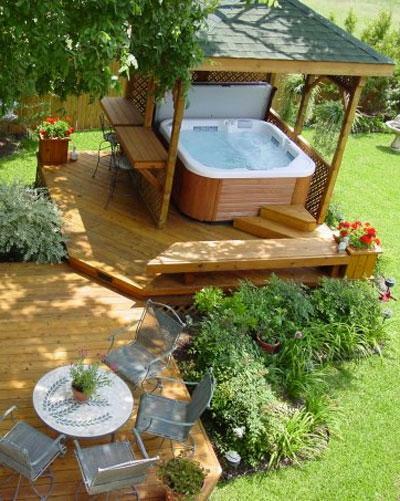 The lower area to be predominantly for cooking and entertaining, the upper level to house the hot tub under a gazebo. We incorporated fixed seating and a bar. All in all, a fantastic entertaining area that will be used year through. Project time 5 weeks, completed on time and on budget. If you would like a free quotation or simply to discuss what our services are, please call or use our Contact Us page.